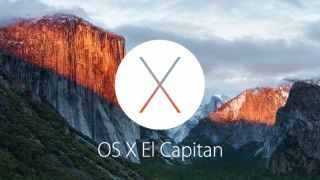 Update: OS X 10.11 El Capitan get its first update to fix a boatload of issues, read on to find out which ones will affect our OS X 10.11 El Capitan review. It's been some time now since Apple's iOS-inspired OS X 10.10 Yosemite leapt onto the Mac. Attention has now turned to the next major release of OS X, which is expected to be named - you guessed it - OS X 10.11 El Capitan. Like iOS 7, Yosemite's bold colours and flattened icons divided opinion, but the stats paint a positive picture: more than half (58%) of Mac owners were running the latest version of OS X in April, according to data by NetApplications. It's hard to deny that Yosemite looks fantastic on Apple's newer computers with Retina displays - such as the iMac with Retina 5K and the new MacBook - but users on older hardware have reported sluggish performance since upgrading. As such, OS X 10.11 will focus on "under-the-hood" performance improvements, rather than new features, as OS X 10.6 Snow Leopard did back in 2009. Snow Leopard famously launched with "0 new features", instead focusing on improving performance and service support. This includes 1.4 times faster app launching than its predecessor, two times faster app switching and email opening, as well as four times faster PDF previews. While Apple hasn't quite gone with the stringent strategy of no new features, it has aimed to please developers with a better optimized OS complete with Metal pulled from iOS 8. OS X 10.11 El Capitan is out now. You can grab it by heading over to the Mac App store, clicking Updates, and then Download. The last two versions of OS X, Yosemite and OS X 10.9 Mavericks, were both free and El Capitan also costs the princely sum of nothing. It would have been especially hard to see Apple going back to paid annual updates in light of Microsoft's decision to offer Windows 10 as a free update to Windows 7 and Windows 8.1 users for one year. Releases of OS X were named after big cats prior to OS X 10.9 Mavericks, with the last being OS X 10.8 Mountain Lion. Apple indicated that future versions would be named after California locations from that point onwards, starting with OS X 10.09 Mavericks. So what's next? Apple has trademarked a number of names that could be used for OS X 10.11, including: Redwood, Mammoth, California, Big Sur, Pacific, Diablo, Miramar, Rincon, El Cap, Redtail, Condor, Grizzly, Farallon, Tiburon, Monterey, Skyline, Shasta, Sierra, Mojave, Sequola, Ventura and Sonoma. Of course, there can only be one and the Cupertino company decided to go with El Capitan. Apple released the first update for OS X El Capitan on October 21, 2015 (conveniently on the same day Surface Book and Surface Pro 4 reviews went up). Officially bring up the OS X up to version 10.11.1 the update fixes several of El Capitan's widespread issues. Most notably the update fixed El Capitan's issues with installing and update apps that cause Macs to suddenly restart or show a black screen. The patch also cleared up the issue that caused the Mail client messages and server information to disappear. VoiceOver, the screen reader built-in to OS X 10.11 also came broken at launch but this late November update has since resolved the issue. Aside from the bug fixes, the 10.11.1 update also brought with it 150 new emojis including the controversial middle finger.